While typos are usually harmless little annoyances, sometimes they can completely change the meaning of a religious edict, embarrass a nation, or cause an engineering project to end in disaster. Here are some particular doozies from the history of typos. In some copies, Psalm 119:161 reads "Printers have persecuted me without a cause" rather than "Princes have persecuted…" Above, you can see the text as it was meant to be read, without the errata. 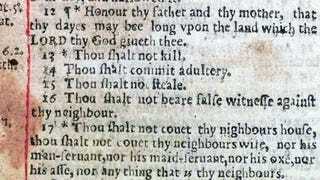 In the Ten Commandments the word "not" is missing from the Seventh Commandment: "Thou shalt not commit adultery." The text of Psalm 14 read, "The fool hath said in his heart there is a God," rather than "The fool hath said in his heart there is no God." Above, you can see the text the way it's supposed to be written. It has a nickname of "A Baskett-ful of Errors" because of its numerous typographical errata. The most-known one is in the chapter heading for Luke 20, reads "The Parable of the Vinegar" instead of "The Parable of the Vineyard." Webster's chemistry editor, Austin M. Patterson sent in a slip reading "D or d, cont./density" in 1931, but it was misinterpreted as a single word. This was a plausible mistake because headwords on slips were typed with spaces between the letters, making "D or d" look very much like "D o r d". In 1 Peter 3:5: "For after this manner in the old time the holy women also, who trusted God, adorned themselves, being in subjection to their owl husbands." instead of "own husbands." The Mariner 1 mission in 1962 ended in failure above the Atlantic Ocean, never flies by Venus. The cause was a missed hyphen.